Ancient Stones - Borders - 021 Cairn, White Meldon, Peebles. The large Iron Age hill fort on White Meldon boasts the remains of an 13.70m diameter stone burial cairn. Although much reduced in height, some of the larger kerb stones are still in place. 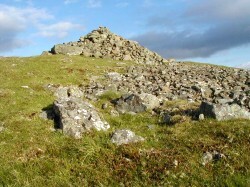 A row of large stones, possibly the remains of a wall, can also be seen running between the cairn and the rocky outcrop with a trig point. From Peebles take the A72 Glasgow road. After 4 miles turn right onto minor road for Eddleston. After approx. 4 miles stop in parking area at entrance to Nether Stewarton forest. White Meldon can be seen to the east and the cairn is located on the western side of the summit. By road side at entrance to Nether Stewarton forest or in parking areas along Meldon Burn. None to date. However, the two standing stones at Sheriffmuir can be seen to the south and the area of the cairn on Green Knowe is also visible, though partly screened by trees. The stones that form the kerb of this cairn are not that impressive but the entire summit of White Meldon forms the largest Iron Age hill forts in the county. Four separate defensive lines can be traced, though not all remain intact. Of other antiquities in the area, another hill fort can be seen on Black Meldon, just across the valley and the location of another cairn can just be made out to the north west on Green Knowe. To the south west on Sheriffmuir, two standing stones can just be made out, although binoculars are required.